A plaque details Australia's involvement in the Battle at Buna during World War Two and commemorates the contribution of South Sea Islanders to the defence of Australia. The Papuan village of Buna was the main base for the Japanese advance along the Kokoda Track. 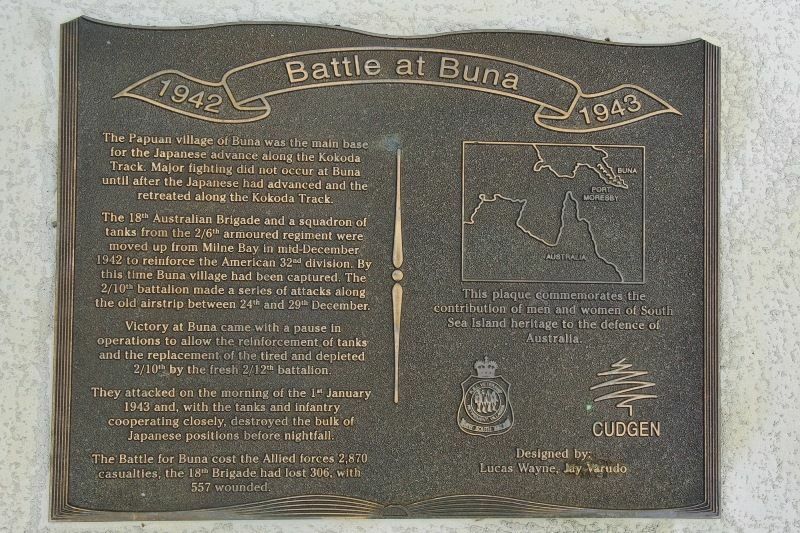 Major fighting did not occur at Buna until the Japanese had advanced and the (sic) retreated along the Kokoda Track. The 18th Australian Brigade and a squadron of tanks from the 2/6th armoured regiment were moved up from Milne Bay in mid-December 1942 to reinforce the American 32nd division. By this time Buna village had been captured. The 2/10th battalion made a series of attacks along the old airstrip between 24th and 29th December. Victory at Buna came with a pause in operations to allow the reinforcement of tanks and the replacement of the tired and depleted 2/10th by the fresh 2/12th battalion. They attacked on the morning of the 1st January 1943 and, with the tanks and infantry cooperating closely, destroyed the bulk of the Japanese positions before nightfall. The Battle for Buna cost the Allied forces 2,870 casualties, the 18th Brigade had lost 306, with 557 wounded. This plaque commemorates the contribution of men and women of South Sea Island heritage to the defence of Australia.